The e-learning sessions are intended for use by nurses and health visitors. Three new introductory sessions were added in July 2014 following a successful nationwide roll-out of face-to-face training nationwide by the Institute of Health Visiting. In the Health Visitor Implementation Plan 2011-15 – A Call to Action, published by Ministers on 8 February 2011, the government committed to developing a larger, re-energised health visiting service which needs to rapidly expand to meet the growth aim for this Parliament. Deliverables for health visiting are also included in DH’s business plan on the No. 10 website. The Health Visitor Implementation Plan contains core aims to “improve opportunities to use the full range of health visitor skills and re-emphasise health visitors as key public health professionals” and to “ensure a strong focus on responding to differential needs and improving outcomes, and that systems promote effective join-up between services in ways that best meet local needs”. Training health visitors to identify and deal with domestic violence and abuse, including making referrals to specialist counselling, is a key driver of these aims. A key commitment made within ‘A Call to Action – One Year On – Health Visitor Implementation Progress Report’, was to consider how to link into the tools, skills and guidance for health visitors and school nurses to be better equipped to deal with Domestic Violence and Abuse. Violence damages physical and emotional health and can have long lasting negative impacts across a wide range of health, social and economic outcomes. We also know that domestic violence and abuse have a major impact on the health, social, emotional and intellectual development of the child and young person and have a major impact on the family. Identification of need and early intervention/work with families can significantly reduce risk of ongoing harm and is important not only for the wellbeing of the child, but to the health and wellbeing of the children and families affected. A one-day training course has been developed, which is intended to introduce mental health practitioners to the practice of routinely asking about client experiences of violence and abuse in mental health assessments. It is suitable for all practitioners working in mental health services such as nurses, therapists, psychiatrists, IAPT counsellors, health care assistants and support/recovery workers. It can be delivered to whole teams or as open courses accessible across a Trust (in some Trusts it is a mandatory course for all staff conducting assessments). It is recommended that no more than 20 participants attend each course as the training includes experiential and participatory elements. The purpose of the course is to help staff become more confident about asking in assessments whether clients have experienced violence or abuse at any point in their lives and in providing support and signposting following disclosure of such experiences. The expectation is that, if they don’t already, staff who undertake assessments will begin ‘asking the question’ following the training. 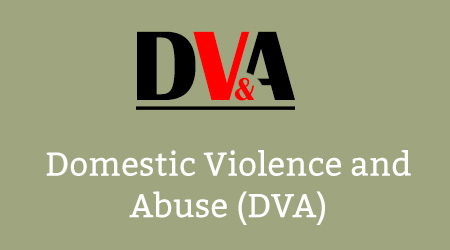 The training should be delivered by practitioners with some experience of supporting clients who have experienced domestic or sexual violence/childhood abuse. All materials for delivery and links to research evidence and background reading are included in the trainers’ notes – which also provides a slide-by-slide script to accompany the PowerPoint presentation. Links to both the PowerPoint presentation and the trainers’ notes can be found below. This is a completely updated third edition (November 2014) of a course first delivered in 2006 to support the pilot implementation of the Department of Health policy on routine enquiry in mental health services. This edition of the course has been designed and produced by Dr Sara Scott (DMSS Research) and Dr Jennie Williams (Inequality Agenda) who have been training mental health professionals together since 1999. Enquiries about this course and other training available on gender, violence and abuse can be directed to them: sara@dmss.co.uk and jennie@inequalityagenda.co.uk. 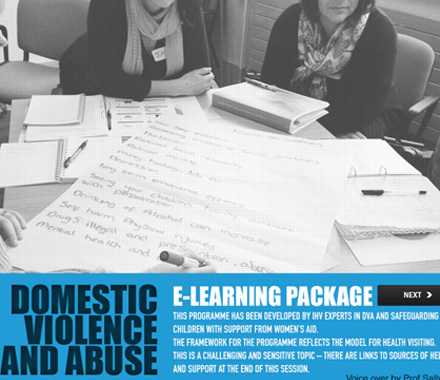 If you already have an account with e-LfH, then you can enrol on to the Domestic Violence and Abuse programme by logging in to the e-LfH Hub, selecting My Account > Enrolment and selecting the programme. You can then access the programme immediately in the My e-Learning section. The Domestic Violence and Abuse programme is available in the Open access sessions section above. If you access the content using this link, you will not have to log in but your activity will not be tracked and you will not be able to generate a record of completion. The Domestic Violence and Abuse programme is also available to NHS healthcare staff via the Electronic Staff Record (ESR). Accessing this e-Learning via ESR means that your completions will transfer with you throughout your NHS career.